An audacious rereading of the diplomatic history of WW II by a Pulitzer Prize-winning Minneapolis Star-Tribune investigative reporter. Kilzer argues that Winston Churchill deliberately nurtured Hitler's illusion that powerful British factions sought an end to the war on terms favorable to Nazi Germany, and thus outwitted Hitler into starting a war against the Soviets that Germany could not win. According to this theory, the May 1941 flight of Rudolf Hess to Scotland was the culmination of a British intelligence operation. The author argues that Hitler, out of admiration for the British Empire, a conviction that the English and the Germans were racial allies, and a desire to free his hand in the West before invading the Soviet Union, sincerely sought peace with Britain, and that Churchill exploited appeasement-minded Britons (like the Duke of Hamilton, whose messages through intermediaries persuaded Hess to make his flight, and the former king Edward VIII) to foster in Hitler the idea that Britain would agree to peace on Hitler's terms. Kilzer builds a reasonably convincing circumstantial case out of numerous well-documented facts: Churchill's desire to involve Germany in a wider war; Hitler's wish to settle with Britain before initiating war with the Soviet Union; and various clandestine contacts between British and German agents. Finally, Kilzer explains some aspects of the mysterious Hess flight--the failure of the British to use Hess's capture for propaganda purposes; the fact that the last day of Hitler's bombing of London coincided with the Hess flight; and the medical evidence indicating that the man who died in Spandau prison in 1987 was not Hess (Kilzer speculates that British agents may have killed Hess to prevent the story of Churchill's deception from emerging). Certain to be controversial, Kilzer's is an absorbing and cogently argued original contribution to WW II literature. -- Copyright ©1994, Kirkus Associates, LP. All rights reserved. 5. 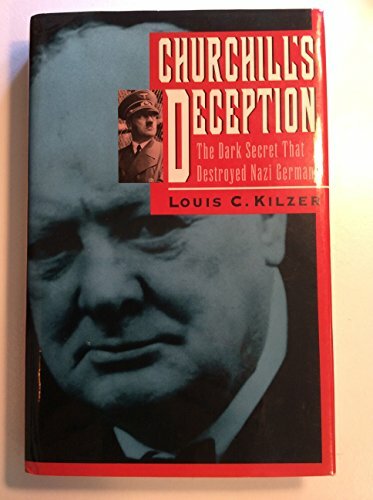 Churchill's Deception: The Dark Secret That Destroyed Nazi Germany Kilzer, Louis C.